How can you be the happier actor? How do actors keep their smile while facing adversity? If we’re to believe Irving Berlin, show people are deliriously happy—branded so in his jaunty show tune lyric, “There’s no people like show people. They smile when they are low.” Possibly the only show “people” who match Berlin’s optimism are the saccharine animatronics singing at Disney’s Its A Small World. Actors endure more rejection per week professionally seeking temporary employment than does a civilian job hunting a month for employment that is to be permanent. That’s a lot of lows at which actors are to smile at in return (thank you, Mr. Berlin). Yet, actors push forward. Actors seek coping skills so as not be mired in the debris of rejection. The happier actors climb and rise above the pile of dismissal. Atop the carnage actors look out on to the horizon of “What’s next.” How do actors keep their smile while facing adversity? Equal all auditions with the same goal and manner of importance. Stressing more importance of one audition over another places unnecessary stress, worry, and anxiety on the actor. All auditions offer individual opportunities for actors to play their skills with a spirit of fun. A period of control the actor owns. When placing all auditions on a level playing field the life-long career process of auditioning is no longer intimidating, or a cause for worry. The audition is but a cog in the wheel of effectively pushing forward the machinery of the actor’s industry. Stage and screen star James Rebhorn spoke of his auditions as a, “part of my ordinary day.” He’d plan errands for afterwards so that the audition didn’t dominate the day or his focus. His life dominated the day. His auditions became more relaxed. He was comfortable. Onward he’d go to his next duty for the day. One Broadway actress volunteers after her auditions to feed the homeless at shelters. Some actors schedule to volunteer, directly after their auditions, to assist at an animal shelter, or to work with children with disabilities. Plan on productivity for directly after an audition (or series of consecutive auditions) so that you are being further productive. The happier actor is the actor who gets out of their head after an audition and jumps into life. When actors announce on social media that they, “have a huge audition” later that day, or need “Your prayers and support for a big call-back” the actor is placing undue pressure on themselves. The actor now must live up to their social media audience’s expectations. An unnecessary weight the actor has placed on their own shoulders. Worse the actor is inviting follow-up inquiries. Friends and family asking after the audition, “How did it go? “Did you get the part?” “You’re so right for that role. There’s no way they don’t hire you.” When the audition doesn’t go as well as the actor anticipated the actor is then embarrassingly reduced to answering with disappointment to the follow-ups. The actor may then perceive their work in the audition (or entire career) as a failure. Update (or create) your website that represents your work. Research online for outreach to potential employers. Don’t just answer present casting notices. Begin reaching out to independent filmmakers, theaters, and advertising agencies (the latter for print and commercial work). Get entertainment employers knowing you BEFORE they need you. You just may save them the cost of future auditions. Need representation? Send land mail inquiries for when seeking representation. Alex Butler, Senior Legit Agent for Henderson/Hogan, advises actors, “My assistant deletes emails. I open all land mail from actors that lands on my desk. Read online entertainment industry trade publication. Be informed as to what is happening, and discover what is about to happen. Plan as to how to be a part of what projects are going to happen before they begin casting. Set goals. Reach out to the creatives. Get to know them, and let them know you. Responses to your work will be similar as that of marketers who reach out to you: eventual response or no response. There will be immediate responses. There may be responses that come months to a year later, or longer. Give your efforts time. Keep reaching out to contacts already known, while expanding your outreach to new contacts. Dripping water cracks the stone. Facebook, Twitter, Instagram and other social media platforms are digital Petri dishes that foster and grow your comparison worries. Avoid long periods of sustained exposure to social media. Stop watching for, and comparing to yourself, the achievements of others. Your perception of others’ successes may not be the happy reality you believe they are enjoying. Focus on what you need to do to achieve your goals. Take a class that truly educates, and expands your skill set as both an actor, and as a business actor. An actor is not only the product but the promoter of the product. The more assets (skills) an actor has the more marketable (employable) is an actor. While learning you’ll network with actors, and other professionals in the business, who will inform you of opportunities available to you. You may also gain great new friends. Movement forces blood flow which stimulates brain activity. Increased continuous movement also diminishes toxins in the body that cause us to be sluggish and depressed. An exercise routine can be as simple as fast-paced walks for 30 minutes to an hour around your neighborhood. Or solo or group activity at a gym. Move the body and you’ll move ahead emotionally. Volunteer an hour a week at a charity, and/or volunteer time and efforts at a theater company or an arts related organization. Helping others in need provides you the giver a sense of purpose while distancing you from the worries you may be letting get a grip on your goals. And possibly, while volunteering an arts organization, you may come across someone who needs your skills professionally. Feed your soul by lending a hand to others whose souls need nourishing. I often chide that I was once the oldest casting intern at age 29. My casting, directing, and teaching career owes much to the foundation of my being that ancient intern. Interning at a casting office, talent agency, or production company brings you closer to knowing professionals as individuals. Entertainment is a people business. An actor will have opportunity to witness while interning what fellow actors do that gets a positive response from casting and agents. And the actor will eye what mistakes actors make that drives away entertainment professionals. Can You Be a Happier Actor? Yes. But happiness is relevant to each of our needs and desires. No one’s happiness is the same as that sought by others. Once you define what your goal is for happiness then support and nourish its longevity. Paul Russell’s career as a casting director, director, acting teacher and former actor has spanned over thirty years. He has worked on projects for major film studios, television networks, and Broadway. He’s directed in New York and regionally. In 2017 Paul will be remounitng his production of MAMMA MIA! for the Barter Theatre. He’ll also direct productions of FOOTLOOSE and Disney’s THE LITTLE MERMAID. Paul has taught the business of acting and audition technique at NYU and teaches master classes at dozens of acting programs at universities including Hofstra, Elon, Wright State University, and Rutgers. He is the author of ACTING: Make It Your Business – How to Avoid Mistakes and Achieve Success as a Working Actor. For more information on Paul’s projects, please visit www.PaulRussell.net. The debate of ‘going union’ or not, and ‘when’ or ‘if” is a juggernaut of career soul-searching. When is going from a non-union actor to a union actor best? When is going from a non-union actor to a union actor best? Each actor has their own journey to one of those favored union cards be it from Actors’ Equity Association, SAG-AFTRA, or AGVA or all three: the triple crown of union status. Once there was an impatient, young actor hired as a non-union performer by one of my L.O.R.T. clients. The actor strongly believed that if he didn’t get his Actors’ Equity card by age twenty-one his career would be over. When hired he’d hit his self-imposed card deadline but we hired him as a non-union performer (the producer’s budget dictated the necessity of a non-union actor to work alongside AEA actors). During his contract at the AEA theater he was miffed when he wasn’t bumped up from ensemble into an understudy vacancy. He threatened to quit. I intervened. We offered him his AEA card to remain. While the solution provided immediate gratification for all sides, especially for the actor, it didn’t help him much past the near-term. Being young, developmental (i.e. new to the business), and a physical type that isn’t easily marketable for an actor he didn’t work much (nearly not at all) after receiving his AEA card. He was competing against stronger-skilled, union performers. Had he remained non-union for his early to mid-twenties he more than likely would have worked more often. As a non-union talent he was more valuable and desirable to union houses that hire non-union. Plus, he could work the lucrative market of non-union tours. I know of a good number of actors who played a non-union tour of a Broadway musical, and then were “upgraded” to making their Broadway debut in the NY counterpart of the show. Union card snagged. Whatever union represents your field of expertise know that the initials that follow your name designating inclusion into the club will not make you better at what you do. Only you can do that; not a union card. A union is for protection not perfection. Do I (the actor) want to work near continuously (non-union)? Or do I want to work occasionally with the possibility of better pay, benefits, and possibly better working conditions (union)? As a performer; does my age, skill set and experience equal that of my union peers? The debate of ‘going union’ or not, and ‘when’ or ‘if” is a juggernaut of career soul-searching. The when, if, and why can only be answered by each actor’s circumstances, desires, and most importantly; needs. “Dear Actors. PLEASE READ BREAKDOWNS THOROUGHLY BEFORE SUBMITTING. The sentiment may be viewed as a harsh rebuke from this casting director who is widely known in our community to be accessible and deeply supportive of actors. But the casting director above has a frustration shared in the casting community. Every casting director encounters being stood-up repeatedly by actors for what is essentially a professional date to employment. Yes, between an actor submitting and the casting director contacting the actor with an appointment, the actor’s schedule and circumstance may have altered to be that they are legitimately not available for the project and/or audition. Completely understandable. But when the percentage of turn-downs of appointments rises to near a quarter from the actors asking for an appointment (which happens) and the percentage of actors out of work is in the 90s percentile: too many peer actors are playing catfish with casting. Review agency submissions (in New York alone there are over 50 offices representing at the minimum 100 – 150 actors each. LA? Actor representation is as common as Starbucks is to suburbia). The casting director then ranks choices to 1st, 2nd and 3rd priority to be contacted. Why the ranking? Because 1st and 2nd choice actors desired to be seen who are submitted by agents have a 50-50 chance of passing on the audition for various reasons. Enter the 3rd choices… 4ths and 5ths. Review unrepresented actor submissions. Actor response can be as few as 300 to over 1,000. The casting director is eyeing each picture; each resume; each credit on the resume just as they do with the actors who are represented. As with the represented actors the non-represented actors are placed with the represented actors in 1st, 2nd and 3rd priority to be contacted. Then the casting director reviews all choices and plans how to strategically place each actor into individual 5 – 7 minute time slots of which the casting director may only have 20 – 30 for one day. Most casting directors do not schedule the actors by happenstance. The experienced casting director methodically plans to the actors’ and projects’ best interest plotting which actor is seen in relation to the other actors being called in. Who do I want to be the first actor to set the day’s expectations? When do I put in the actor I have faith in but that actor from my experience needs a bit of hand holding? When do I place them in the schedule to have that actor at their best? Do I place Actor Jones (who I know will blow away my director) early or do I wait until after lunch when the creative team is refreshed but anxious that they may not have choices. No. No, I don’t. In casting there’s a phrase we use at the table… “How deep are we?” Meaning: if our first choice who auditioned passes, and then our second choice who auditioned passes how deep can we go until we’re forced to begin the entire process again with actors not seen? A casting director who can’t go deep in one audition round is the casting director who retires to a MACY*S perfume counter. The casting director places great concentration and effort in accepting and reviewing actor submissions. Respect by a portion of actors seems to be dwindling for the process and dedication to actors being considered for an audition appointment: of which there too few. A producer’s budget is the true gatekeeper. The actor is seriously interested in the project. The actor is available for the project and the audition. If offered a contract the actor will more than likely accept the job. If an actor cannot answer ‘Yes’ to the preceding commitments: Do Not Submit for an Audition. The old-school, foolish thinking: “Oh, I’ll just submit myself to keep my face in the casting director’s eye” is b.s. An actor submitting for consideration to a casting director for a possible audition appointment is no different than proposing to a romantic interest, “Would you be interested in a date?” If the person of desire answers “Yes” and then the inquirer replies “Only kidding. Not interested.” how much time do you think there will be before a palm stings a cheek? An actor submitting to casting because they are a marketing flirt will leave the actor with few professional romances in this industry. One pivotal, pro-active, career-changing step delivered actress Holly Williams five continuous years of 365 days-per-year of union principal work plus paid vacations and benefits. Holly also received multiple agent meetings and representation. Gonzalo Trigueros booked a principal role in his first film after he, like Holly, discovered how to snare successfully the attention of both casting and representation. Pinpointing, leveraging & effectively branding your individuality. Includes: creating dynamic actor web sites (including mobile friendly), email campaigns that gain entertainment industry attention (without being lost to spam), and smartly leveraging social media and the digital revolution to an actor’s advantage to make each actor rise above the competition. Plus, ensuring your hard-copy marketing gets seen by gatekeepers: guaranteed. How do some actors get more call backs & job offers? We target the behind-the-casting-table insights into what makes each actor’s individuality excel while in the audition room. Utilizing audition scenes—from current screen and theatrical projects—I and my assistant work with each actor to command every audition encountered. Q & A preparing the actor for the panel. An open Q & A with a panel of entertainment executives who represent actors as principals in major-studios films, TV series, Broadway, national tours, and regional theater. Then… each actor is individually introduced by me to panel members. The actor presents their new and improved skills discovered from the prior 3 weeks of my personal guidance. The evening culminates with individual feedback for each actor as provided by the panel. Two-dozen universities from Yale to Elon to Wright State annually invite me share my NYC master classes on their campuses with their acting-major seniors. You can get a jump on those actors now sharing with the entertainment executive panel what you and I worked on together to showcase your improvements. October 2015 is the ONLY 1 of 2 master classes of this kind for 2015/16 to be held in NYC. Show us what you have and desire. Let’s get to work, my friend. Paul Russell’s career as a casting director, director, and former actor spans projects for major film studios. His involvement with casting principal talent includes over 500 projects covering: 20th Century Fox, HBO; television networks, Broadway, and regional theater. His work as a casting director is recognized with the Drama Desk winning (best casting ensemble) COBB produced in New York & LA by Kevin Spacey, COSBY, ER, the original company of DISNEY’S BEAUTY AND THE BEAST, the original productions of STRING FEVER (starring Cynthia Nixon), PERA PALAS (Sinan Unel), WOODY GUTHRIE’S AMERICAN SONG (Drama Desk noms.) plus casting for Asolo, San Jose Rep. Two River Theatre Co., Florida Stage, Nebraska Shakespeare Festival, Lark Theatre Company, Barter Theatre (TONY recipient) and over a dozen more NYC and regional theaters. As a director featured in American Theatre Magazine Russell worked with legendary playwright John Guare directing the regional premier of Mr. Guare’s A FREE MAN OF COLOR. Paul also directs for the TONY-winning Barter Theatre, and in New York. 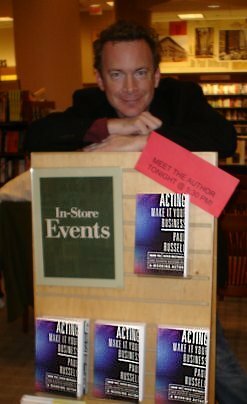 Paul is the author of the best-selling acting book for actors ACTING: Make It Your Business – How to Avoid Mistakes and Achieve Success as a Working Actor (Penguin Random House). He teaches master classes at over two-dozen universities including: Elon, Wright State University, Illinois Wesleyan University, Rutgers University, Emory & Henry College, and Louisiana State University. Russell taught the business of acting for NYC-Tisch‘s acting program at The Atlantic Theatre. If trumpeting for votes to receive an ‘award’ was the basis for legitimate honor then how soon until Donald Trump rallies his followers to vote him a Nobel Prize? An actor reached out to me regarding an acting coach who touts prolifically online to his being “a Back Stage award-winning acting coach.” When researching the acting teacher’s credentials and professional history I discovered multiple empty resume pages on casting’s and representation’s go-to casting resource Breakdown Services. Odd that the actor/acting coach created several profiles but left each space for a resume blank. These entries are only seen by the entrant and by entertainment’s gatekeepers who have been granted private access by Breakdown Services. One of his three profiles did contain substance within his Special Skills section. Although I question the validity. The white actor/acting teacher has Russian, Puerto Rican, Irish, and New England accents while promoting he’s of African descent and speaks fluent Korean. Perhaps he should receive a Back Stage award for Most Likely to Page at the U.N.
Back Stage, like other publicly polled award benefactors, has no vetting process for their ‘honors.’ No academy of learned entertainment peers who owl over the scope of entertainment professionals. No red carpet ceremony leading to a hall of seated professionals. No precious mineral or Swarovski statutes handed to masters of craft. Recipients of the Back Stage nod for ‘best’ of whatever: audition studios, acting or vocal coach must rely on their soliciting votes themselves as do politicians running for elected office. If trumpeting for votes to receive an ‘award’ was the basis for legitimate honor then how soon until Donald Trump rallies his followers to vote him a Nobel Prize? Fortunately the Nordic organization which has honored Einstein, Desmond Tutu, Martin Luther King, Madame Currie, and Malala Yousafzai has no laureate honoring bluster, and best blonde from a bottle. Want to know what acting coach, voice teacher, or audition studio is best for you? Ask working professionals and peers whose values and opinions you trust and respect. With awards by solicitation you’re relying on votes cast anonymously by the nominees; uninformed neophytes; the prejudiced; and those who check-box a ‘yes’ because the nominee’s name appears vaguely familiar. And what of the numbers who participated in the open poll? The tally could be a few as a single vote to as many as several hundred. Is that a fair and broad range of insight to serve your craft well? To be objectively informed research beyond the award-by-poll nominee’s and recipient’s marketing and website. The praise on a virtual home base is too often stolen from a thesaurus. And don’t click to outside websites such as IMDB. IMDB’s content is not reliable. The information within is likely supplied by the subject and/or the subject’s publicist. Trust the values network you’ve built to inform and guide your journey. His phone calls to me came daily. Jon Stewart, long before his Oval Office meetings with President Barack Obama, doggedly pursued a meeting with a woman most people never heard of but have seen and enjoyed her work. His phone calls to me came daily. Jon Stewart, long before his Oval Office meetings with President Barack Obama, doggedly pursued a meeting with a woman most people never heard of but have enjoyed her work internationally. Working with the formidable and detail diligent casting director Mary Colquhoun on the casting of Picture Perfect starring Jennifer Aniston, Kevin Bacon, and written and directed by Glenn Gordon Caron (Moonlighting, Medium) I was Mary’s gatekeeper for three films. Mary was strictly devoted to her English birth certificate. God save the assistant who didn’t adhere to writing all correspondence and deal memos in the Queen’s English. A generous heart buried in stone Mary brought many of her assistants to tears, including and allegedly Alan Filderman who she berated for tripping and injuring himself in her presence. Sleuthing successfully to find this then little known actor/comedian came via Screen Actors Guild. I was informed by the SAG membership rep that the ‘h’ in Jon’s name was indeed silent. The phone number SAG provided began with a 201 area code: northern New Jersey. Stewart hadn’t representation. During our first conversation I was surprised when Jon informed me, “I’ve been waiting for your call Paul.” He was, as he is today, exceedingly proactive in attaining goals. He leveraged his network of fellow actors and comedians to get himself into studio executive offices including Mary’s. Jon wasn’t shy, nor was he obnoxious. As I discovered over a month of phone conversations Jon Stewart was, as he is today, a gentleman. Stewart knew the game of courting gatekeepers and he mastered it well. Near daily I had to call Jon Stewart to apologize and cancel his scheduled meeting with Mary and Glenn Gordon Caron that I’d just canceled several times and rescheduled each day prior. Caron’s daily calendar changed more often than a chameleon’s skin during India’s Spring Festival of Colors Celebration. Jon never voiced frustration. Snarky? Wonderfully yes. But never disparaging or ill tempered. He displayed then to me privately his humor his audience now enjoys. Jon was also keen with insight. Jon Stewart knew who else we were seeing for the love interest of Jennifer Aniston’s character. He floored me when he made an inquiry as to how far along was Caron’s interest in Jay Mohr. Stewart showed then what we know now; he’s passionate for being well informed. Eventually, Stewart didn’t wait for his phone to ring with my cancellations. I remember early morning calls from Stewart with one starting with his asking, “Are we on today Paul? Or is Glenn Gordon Caron doing a steam with Bacon?” Our formal and brief business discussions evolved into lengthy chats. There was never malice or bitterness in his subtext. Jon Stewart knew how to win the game of patience. He played it well. When Mary would next inform me that “A ring needed to be made to Mr. Stewart” to once again cancel I dreaded being the bearer of disappointment. But I knew Jon Stewart would handle the momentary setback with humor and grace, and I partly looked forward to the laughs he would evoke from me. Jon eventually had his meeting with Mary and Glenn Gordon Caron. Jay Morh won the role. The eventual success of Jon Stewart’s patience and pro-active perseverance has been on display in the opportunities he’s created and/or encouraged elsewhere. Jon Stewart’s present day success did not come from a sensibility of entitlement. Humility, ambition, humor, diligence and an eagerness to share common respect propelled his desires to the destinations within his heart. Jon Stewart’s viewers will now be the patient ones. Eager with humor and humility to welcome his charm once more as his schedule takes Stewart on to a new journey and adventure. I miss our calls Jon. And I’ll miss your visits four nights a week to my living room. But at least we’ll both still have New Jersey. Paul Russell’s career as a casting director, director, acting teacher and former actor has spanned more than thirty years. He has worked on projects for major film studios, television networks, and Broadway. Paul has taught the business of acting and audition technique at NYU and has spoken at universities including Yale, Elon and Wright State University. He is the author of ACTING: Make It Your Business – How to Avoid Mistakes and Achieve Success as a Working Actor. For more information, please visit www.PaulRussell.net.